#GradLifeMcGill at Discover McGill orientation 2018! At GradLife, we want to showcase graduate student experiences through your voice, photos and videos. Posts portray your personal reflections, aspirations, triumphs, and challenges through your graduate journey. Creativity, independence, and community are central to us. The mission of GradLife McGill is to showcase graduate students’ experiences through their own ‘voice’ and to foster a sense of community across departments and disciplines. Posts portray students’ personal reflections, aspirations, triumphs, challenges and resources associated with their graduate journey. GradLife McGill is run by the Social Media Team comprised of bloggers, vloggers and Instagrammers. The Team will work closely with the Social Media Coordinators who will train team members by providing guidelines, resources and support. Team members will have access to a broad content bank of topics and themes for inspiration. Creativity, independence, sound ethical judgment and a sense of community are central and highly encouraged within the team. We will select one picture per week to highlight, and it could be yours! 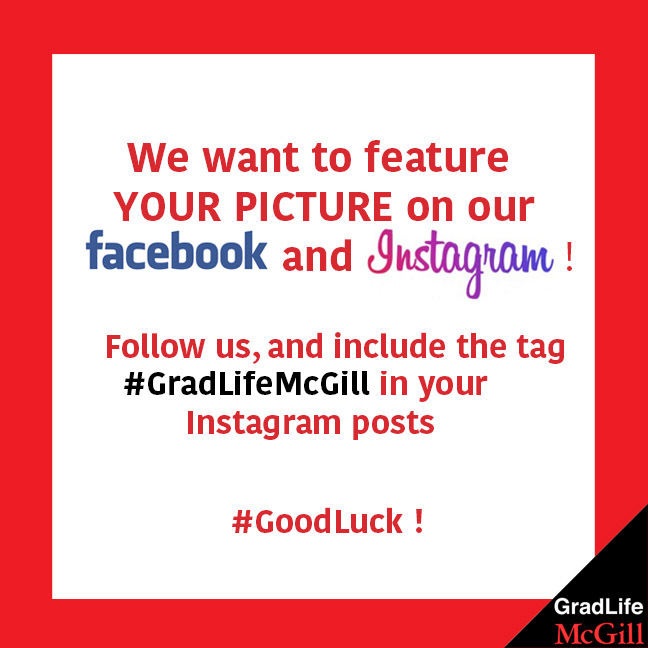 Pictures featured on our Facebook and Instagram channels using the #GradLifeMcGill will be chosen based on the popular vote of GradLife McGill coordinators.